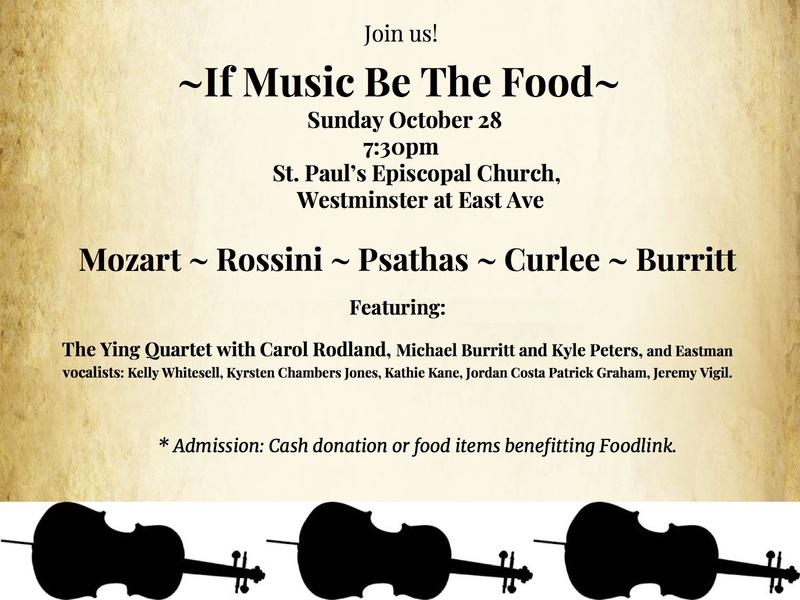 “If Music Be the Food…,” the chamber music series benefitting Rochester’s Foodlink, will open its tenth season on Sunday, October 28 at 7:30 p.m. at St. Paul’s Episcopal Church, at the corner of East Avenue and Westminster Road in Rochester. Admission to the concert is non-perishable food items or cash or check donations. The concert will open with selections from Rossini’s Serate Musicali, featuring Eastman students from the class of Eastman’s Martin E. and Corazon D. Sanders Professor of Voice, Katherine Ciesinski, followed by music for percussion and electronics with Eastman faculty percussionists Michael Burritt and Kyle Peters. The program will close with Eastman’s Ying Quartet and IMBTF’s founder, violist Carol Rodland, playing Mozart’s String Quintet in D, K. 593. 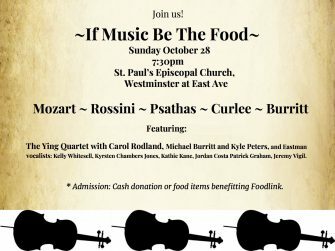 The mission of “If Music Be the Food…” is to increase awareness and support for the hungry in the local community through the sharing of great music. Eastman faculty and students, members of the Rochester Philharmonic, other local professional musicians and distinguished international guests donate their time and talents. 100% of proceeds go directly to Foodlink. All cash donations up to $5,000 will be matched by an anonymous donor. During the 2017-18 season, IMBTF garnered $3,000 and 528 pounds of food for Foodlink. IMBTF was founded by former Eastman faculty member, Carol Rodland, in 2009, and is now headed by Mimi Hwang, assistant professor of string chamber music at Eastman. Peter DuBois, Director of Music at Third Presbyterian Church, and Robert Poovey, Director of Music at St. Paul’s Episcopal Church, are musical and administrative partners in the series. For further information, please visit http://www.ifmusicbethefood.com and on Facebook.